Menus can broaden our lexicon, as I learned today. In this literal edition of "word on the street," we're going to Kramerbooks & Afterwords Cafe, where the brunch menu introduced me to a new phrase this morning: Starphonics. I found the unusual term buried within a list of rules on the menu back. "$8 minimum per table." "All major credit cards accepted." "We do not respond to Starphonics." My first thought was that this was a rarely used form of ebonics, perhaps one with an astronomical bent, but that didn't make any sense. I asked the waiter, and he had no clue (having only worked there two weeks and apparently having not yet read his own establishment's menu.) Then one of my breakfast mates had a flash of insight. "Starbucks!" he said. "It's the language people use to order drinks at Starbucks. Hence, Starphonics." Brilliant! The reference fell into place, given Afterwords' short coffee menu and a fleet of hipster waiters who didn't look too keen on writing down complicated demands for "venti chai double shot espresso with lactaid, no foam, just cinnamon." So that's the explanation I'm going with until someone tells me otherwise. (The only corroboration I could find was here.) What say you, dear readers? Is this the correct definition of Starphonics? Scrapple -- the most mysterious meat you'll ever love. Known and loved by all good Philadelphians, scrapple is what its name connotes: a conglomeration of the leftover pig parts that can't be used in other pork products. It's gray. It comes in a block. You don't want to read the ingredient list. But you close your eyes and enjoy it all the same. Why then, you ask, are you waxing poetic about a weird meat byproduct that could possibly withstand a nuclear winter? Because of branding, my friend. You see, I grew up on Hatfield Scrapple, the packaging of which features bright colors, sunshine bursts, and at one time, a smiling pig whose grin seemed to say, "I fully embrace that my life is building to this moment -- to have my offal end up at your brunch." With such friendly and diverting marketing, I found it easy to ignore scrapple's true nature, and enjoy its deliciousness instead. Fast-forward to my adult life, which finds me in N. VA, where scrapple is not recognized to exist. I have managed to hold out the last 6 months, but the craving hit this morning: I must have scrapple. So off I went to Harris Teeter to search, not expecting much. Imagine my surprise when on the shelf, all alone in its own little stack, sat scrapple! It even had a sign under it saying "new item." The timing could not have been better. I was thrilled beyond belief ... until I looked at the package. Liver mush? LIVER MUSH??? Don't call it what it is, Jenkins! That destroys the necessary suspension of disbelief, punctures the willing ignorance of all die-hard scrapple eaters. First, you put together two words that have negative connotations for most sane people -- liver and mush. Then, you surround it with drab colors and boring design. Where's the happiness?? Where's the distraction?? Where's the manufactured sense of security in actually consuming this product and not inviting death, much less nausea? 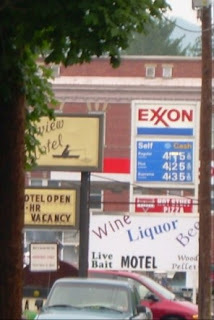 So there you have it -- a tale of two scrapples -- proving that branding really can be all in a name. Oh, I cooked it. I ate it. But I wasn't nearly as happy about it -- and that's a lesson I will carry forward for the rest of my communicating days. 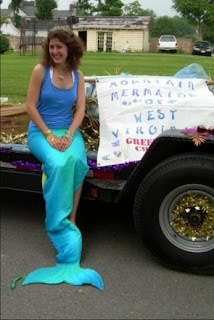 The rumors are true: Mermaids do exist, and they live in the Greenbrier River in West Virginia. Don't believe me? You will soon. I was there. I was among them. In fact, I was one. Here's my tail of adventure. 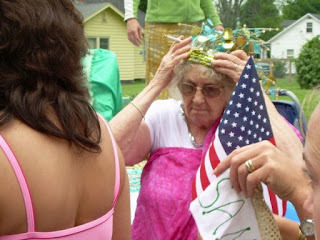 Back in the cold winter, my friend Alyson brought up the 4th of July, and how her wacky West Virginia family was holding two annual traditions the same weekend: her Italian branch's family reunion, and the Mermaid Parade. 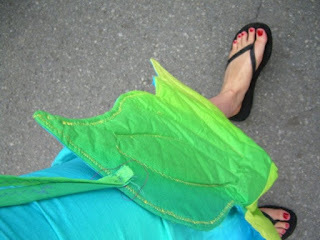 Yes, a Mermaid Parade. 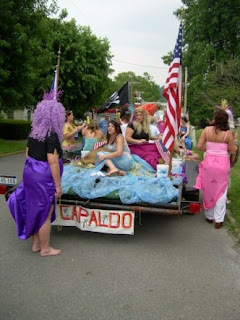 Aly started this tradition two years ago a) because she loved mermaids, and b) wanted to be in a parade. 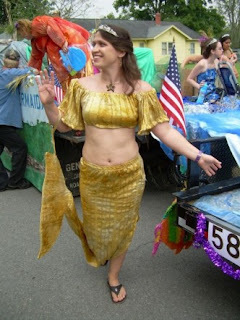 It quickly ballooned to include all of the women in the family, and involves building a float, dressing in mermaid tails, wearing as much sparkly jewelry as possible, and riding in the local parade. She asked if I'd like to join. I asked if the Pope was Catholic. And so it was set that I would celebrate our nation's freedom by traveling to a new state, partying with relatives I wasn't related to, and getting me some mermaid tail. Country roads -- specifically routes 66, 81, and 64 -- took me to Alyson's home some months later for the three-day adventure. To prove just how wild and wonderful it is, West Virginia set its speed limit at 70 one foot over the state line. However, the scenery was so beautiful I wanted to do 25. Ah, irony. I even paused at a rest stop to enjoy the views. Did you read that closely? Julia Rocchi actually STOPPED speeding, and got out to smell the roses-slash-take self portraits. I could tell WV was my kind of state already. This sense was reinforced when I pulled down the gravel road to Aly's parents' house. (The relatives camping on the lawn helped me locate it.) 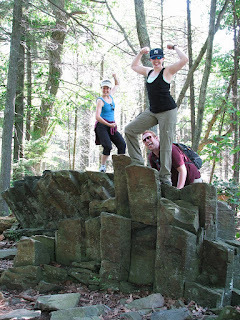 No sooner had I turned off the car, Aly came running to greet me, shouting, "You made it! Want some gumbo??" The next morning dawned humid and gray. It was time for Alderson's annual parade. Now, a note on this event before we go back to mythical aquatic creatures. Alderson has a population of about 214.6 people and 54 teeth. But they don't let their relative smallness keep them from celebrating the 4th in style. I'm talking an entire WEEK of festivities dedicated to our country's independence -- shows, fireworks, picnics ... and of course, the parade. The parade draws every citizen out of doors. 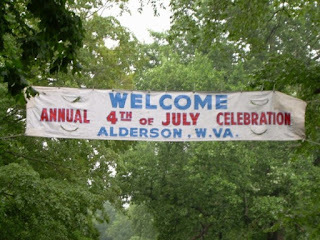 They line the entire parade route (at least 1 mile), and fill every bit of sidewalk on the bridges, residential roads, and historic Alderson pavements. They come with chairs, blankets, flags, pickup trucks, tents, and all their relatives. "Big deal" does not even approach its significance. 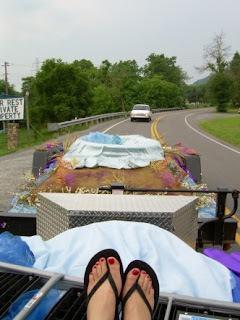 So you can imagine the butterflies in my stomach as Aly and I clambered onto the float to head down the winding road back to town and get in line for the parade. Passing trucks honked and waved, other motorists gawked, and we nearly stuck the whole float on a tight turn into the (wrong) staging area. But we made it in one piece, and it was time to perform. And by perform, I mean drown. 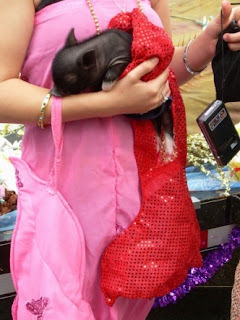 No sooner did we get all our mermaids in order, complete with tails, tiaras, and 3000 necklaces for parade route distribution, then the skies opened up and dropped the rain that had threatened all morning. Our soaked-to-the-bone-edness was rapidly justified by the claim we were being "authentic" -- after all, mermaids aren't dry! High spirits were restored, and the parade began. * Being the banner bearer. * Pandering to the very old and very young. * Accidentally running over the mp3 player that was pumping our float music. * Our official tagline: Save the river, save our tails! * Our unofficial tagline: Save a whale, ride a mermaid! * And, of course, my lovely friend Alyson. When evening fell, magic happened. This rather hickish-looking homestead -- covered in Christmas lights, clotheslines, garden equipment, trailer-turned-houses, and tents, cars and relatives on the lawn -- turned into a wonderland. 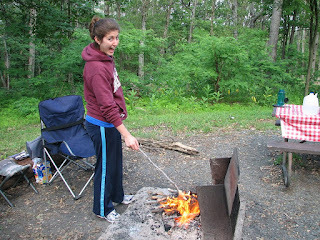 The fire pit roared. The fireflies soared. And the children disappeared into the dusk to play and explore, making me wish I were 10 and with all my cousins again in this fairy-tale landscape. Such round-the-clock fun continued straight into the family reunion the next day. 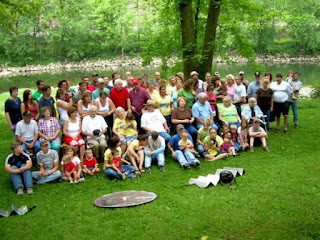 A note on family reunions: Attending ones where you are not actually related to anyone are antithetical, lonely, and freeing all at the same time. I wasn't obligated to talk to anyone or make the rounds. I just got to eat pulled pork and play corn hole whenever I wanted. On the other hand, no one deeply cared who I was, why I was there, or what I was up to in life. Disconcerting. Names include: Happy, Pat (called Susie), Toodles, Zeth, Leonard, Granny, Tooney, Tammy, Zed, Jud, Kimber, Zizzy, Tristan, Trinity (a boy), Braylin, Baylin, Collie, Jeremiah, Basil, Nellie, and Billy Owen. Billy Owen a special case because he's one of three brothers named Bill -- all by different moms. And he met his fourth brother named Bill when they were put in the same jail cell -- the same brother who was killed two weeks later in an auto accident. The weekend ended with a literal and illegal bang during our home-grown fireworks show, with one rocket shooting into the grove of trees 15 feet from the spectators. This confirmed why fireworks are illegal in the first place for anyone but trained professionals. Still, a fitting and explosive end to a fabulous weekend. And what did I learn? That I stink at tossing bean bags into holes. 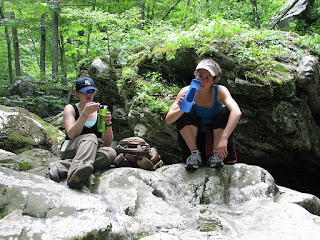 That river shoes are a must for painless river adventures. That sugar is an essential food group in W Va. That my friend has a stronger accent when she's back home. And that families and love are universal, no matter the state, the event, or the float design. I would like to hold my hand. Oh I will run, I will cry. I will run I will. I will cry I will. I would like to hold my little, hand. I will run I will. I will cry. Send me on my WAAAAAAY-ay-ay-ay-ay-aaay-ay-ay-AAAAY! I was actually mishearing the misheard lyrics ... when you sang it, I thought ... Simeon the whale. :o) So many layers. Dude just needs to enunciate. OMG! There is no way that's what he's saying. What happened to Merceo? Did they just forget about him? I totally thought it was "Oh Merceo, oh Merceo to run, bude saya budey umm." Note: My "simmy and the whale" interpretation is courtesy of Mrs. Chevlin, one of my high school teachers, who blithely sang along with these lyrics when we picked it as our senior song, and never questioned why we'd be singing to a whale. Further justification here for this song's incomprehensibility. Let me preface this post by saying I can't make stuff like this up. This story comes courtesy of my friend Alyson from Philly by way of West Virginia. 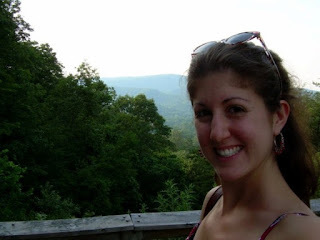 The following is her quick take on her cousin's wedding this past Saturday, hosted near or around Alderson, WV. Keep in mind this is the exact same place I'm headed this weekend for Independence Day, and the exact same family I'll be spending 3 days with (dressed as a mermaid, no less ... more on this later). First, we get there at 2pm and the place is a wreck b/c we have been having major thunderstorms for two days. The wedding is at 4pmand nothing is decorated. The tent was up and there were tables under it and a few strings of xmas lights. My aunt and I stopped along the road and cut Yucca flowers, we strung more lights, added some crepe paper hearts, glitter hearts on the table etc. Nobody could find the topper for the cake (eventually did)except found this weird thing with a bride dragging a groom which we later found out was the topper for the groom's cake. My cousin told everyone that I was the wedding coordinator so everyone kept asking me what to do. I had arrived at 1:30am the night before and hadn't even spoken with my cousin thebride so had no idea. I just kept making things up! Anyway, my dad, granny, Anna and I had to stand under the tent and walk around pushing water out of the sagging areas during another storm while my Uncle and Anna's boyfriend put together an arbor from the dollar store. My mom then decorated it with ivy from a nearby chimney and tulle. The bride was 35 minutes late, the preacher tied the rings on the pillow in a knot, I sang while my uncle played the wedding march on the guitar. They kept telling us to reserve a table for the dj, but no dj ever arrived (or was ordered) so my uncle ended up playing tunes out of the back of his suburban. We had enough ham and baked beans for 300 people, but nothing else. Most of the crowd were holy-rollers (not our family) who don't approve of drinking so everyone walked around with beer in Styrofoam cups. Frida Kahlo's long lost relatives showed up and my sister's and cousin's got stoned. Update: These responses were far too good to leave in my inbox. Feel free to comment here too! Forget the glitter hearts and yucca flowers . . . the baked beans and beer make for an instant party! OMG, Julia. I would love to see the pics. You better be REAL careful when you're out there this weekend. 'Caus yer reeel perdy an' sumun might have a hankerin' fer ya. 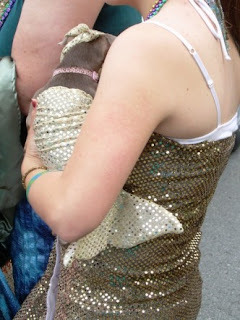 I'm horrendously out of the loop...why are you dressing up like a mermaid?? I could take money savings tip from that bride. Sounds like fun. How come our family can't get stoned at our weddings? We're so pedestrian!